Had this carpet for almost 10 years now and it's survived through major foot traffic down a hallway with ease. Doesn't shed nor fade and it's pretty. I expect this to last me 10 years more. Dimensions 2 ft. 6 in. x 12 ft. I bought this rug for my dining room, as a complement to the 7x9 version in my living room, which I had for over a year prior. I grew concerned that this style might be discontinued, so I jumped. I bought this, plus an 8' round for my dining room, and am glad I did. Now I need not worry that I can't find a matching rug. The color is debated by different reviewers, but I would call this blue an "ice blue" -- with slight green underbase. I have light aqua blue drapes in the dining room, and these go well together -- not a perfect match (who wants "matchy matchy," right???) But close enough to love it. I love wool rugs, and yes, they sometimes have to be vacuumed a number of times to pull off excess fibers, but this is not a downer for me. It's just what wool rugs are. I love the feel under bare feet!! I purchased two of the runners and an area rug...all the same design. I am very happy with the quality. I was a little surprised at how bright the blue color is. I was expecting the blue to be a bit more "sky blue" color. But, the runners are the right size and look great. I haven't opened up the area rug yet. I will want to compare the colors to see if the really do match. Beautiful rug, true to colors on screen greenish-bluish-grayish. Light tone. My cats were quite interested in this rug and began clawing away. Was able to brush away their attacks and after a few weeks they're no longer interested in rug. The design is very pretty, but it's not soft underfoot. Even my tweenager son said, "Mom, what's wrong this rug -- it's not soft?" Soft or not, we kept it and I'm glad we did. It's a thrifty way to update my dark decor. I love our new Safavieh rug runner! Not only was it a great price, it is very well made, and soft on the feet! I received the rug very quickly after ordering. I am very happy with my beautiful new hallway runner! This runner is amazing, excellent quality!! This runner is amazing and we just love it. For the price you are getting a steal. We also purchased two 2x3 rugs to match and the whole set is just stunning. This was my first time purchasing a rug, and I couldn't be more pleased. I was very pleased in how this rug looks and feels. The pile is tightly packed and the rug feels good underfoot. The colors are very pretty, although a little more blue than what showed on my computer. 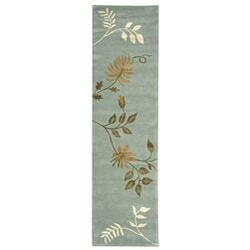 For the price, this is a very nice runner and looks great in my hallway. I love this runner. It fits in the entry way leading into the great room from the front door. It is beautiful and well constructed. I wanted to buy the same area rug for the great room but my husband thought it may be too "matchy matchy" so I am now continuing my search for another rug of similar color. I have already written a review about the other runner I purchased by the same company as this. I purchased them to coordinate with each other. They most certainly do and they are beautiful. These rugs are luxurious and thick, The colors are vibrant and true to what you see online. The quality is amazing, especially for the cost. I highly recommend. First purchase from o.co and very happy with this rug. Color is what you see and there are small flecks of gold in the green of the leaves. Perfect length for my hallway and nice and heavy. Probably will need a grip pad underneath because it slips a little on my wood floors. PERFECT! Just as pictured, nice, heavy wool rug, just perfect! Just wish I had seen it came in 14' too! LOVE IT! I have this rug in my entrance hallway. I have had it for four years. It wears well it looks like the day I bought it. Gold color was barely noticeable - not at all like the graphic on the website. Returned for refund. nice detail on this rug, beautifully crafted. This was a pretty rug, it was too thick and I found myself tripping over it. Plus, it she'd like crazy! Sent it back and ordered the vintage instead! I love the Safavieh vintage rugs!